Pakistan's press shows little enthusiasm for President Musharraf's autobiography - in which he sought to explain the reasons behind his decision to end support for the Taleban following the 11 September attacks in 2001 - with several papers questioning both the contents and the timing of its publication. One Islamist daily accuses Gen Musharraf of deliberately embellishing parts of the book only to boost its sales. Elsewhere, fears are expressed that some of the president's remarks could provoke hatred in religious circles and play into the hands of Pakistan's "enemies". A commentator in the country's most widely-read English-language paper argues that Gen Musharraf's revelations were "stunts" which can only add to the general "gloom" in the country. 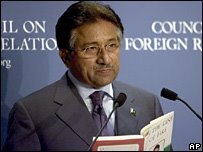 President Musharraf has revealed in his book "In the Line of Fire" that the CIA gave Pakistan a reward worth millions of dollars for capturing more than 350 terror suspects and that Dr Abdul Qadeer Khan sold nuclear centrifuges to North Korea, Libya and other countries only to earn money and satisfy his greed. The book is an incomplete story. It seems that the author has filled his writing with suspense, action and fiction only to sell a record number of copies. The revelations may have a far-reaching impact on Pakistan's internal and external politics as well as on Mr Musharraf's personal life and integrity. He has confessed to receiving millions of dollars in return for handing over al-Qaeda people to the US. On the other hand, he has used humiliating language against religious scholars or "mullahs". These two points could provoke hatred against Musharraf among religious circles. It's unlikely that the book will be popular. Whatever [he] has written regarding the international situation, he has prepared a long charge sheet against Pakistan and passed it on to its enemies. This will make it difficult for Pakistan to defend itself on many issues. Mr Musharraf says Dr Khan may have been involved in the transfer of nuclear secrets to India. What supreme interest can be served by expressing doubts over the national hero as this can only lead to provoking unrest? Dr Khan should also be given an opportunity to clarify his position. On the issue of Dr Khan's personality, the president makes some telling but harsh remarks. He said the man, publicly perceived as the father of Pakistan's atomic bomb, possessed "a great talent for self-promotion and publicity and led the public to believe that he was building the bomb almost single-handedly... What is interesting, or should one say ironic, about these remarks is that even if the president's opinion of Dr Khan was accepted as being close to the truth, much of the reason why the country thought he was the father of the country's nuclear programme is because of the way he was projected by the government-owned media and also indirectly by the military itself. Although Gen Musharraf is known for a candid expression of his views, the fact of incumbency must have weighed on him as a restraining factor lest his revelations and assessments have an adverse bearing on relations with powerful countries whose feathers had best not be ruffled in the interest of the state. There could also be reservations, for entirely different reasons, about the internal issues the book deals with. It is, of course, immaterial whether or not (US Deputy Secretary of State Richard Armitage) threw in the Stone Age reference. It may well have been invented by ... Musharraf to convey the gist of America's uncompromising attitude at the time. The minor controversy stirred by Musharraf's decision to bring up the matter during his US visit has provoked greater interest in his autobiography, which suggests the stunt has served its purpose. But while the timing of the "revelation" may have been unexpected, it is difficult to fathom the expressions of surprise and/or alarm it has elicited from various quarters ... There is too much darkness in the land already, even when the wattage is undimmed. Neither "In the Line of Fire" nor Musharraf's protracted US tour will reduce the gloom.